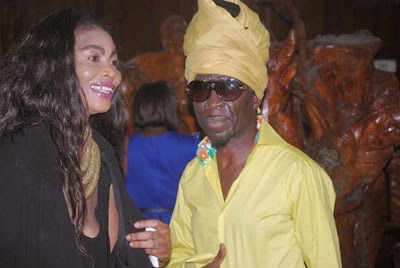 The name of the Ghanaian music maestro, Julius Kojo Antwi, has been entered into the hall of fame as one of the finest highlife legends known in the land. Kojo was on Sunday honoured at the 4th edition of Legends and Legacy (LAL) Ball for his immense contribution to the music industry at the Accra International Conference Centre (AICC). Despite the various technical issues—from over packed auditorium, lack of seats and the power outage that hit the AICC—patrons and fans of the ‘Densu’ singer defied all odds to witness and enjoy the memorable occasion. This year’s Legends and Legacy Ball was hosted by radio personality Kwame Sefa Kayi. As part of the event, a host of talented musicians ranging from South Africa’s Yvonne Chaka Chaka, Kaakie, Wutah Afriyie, Kwabena Kwabena, Akwaboah, Efya, Edem and Wiyaala, among others, were given the opportunity to offer tribute performances to the maestro himself and the audience. Surprise performances by the renowned lawyer, Asante Bediatuo, and a Chinese lady called Akua, sent the auditorium up in cheers. 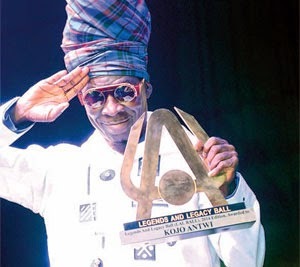 Before he mounted the stage to do his own thing, Kojo Antwi was presented a plaque, two citations—one from the Musicians Union of Ghana (MUSIGA) and one from the LAL committee—a Staff of Office and a Gold Medal from Global Access Savings and Loans Company Limited. Kojo Antwi has won several awards locally and internationally, namely, All Africa Music Awards, Our Music Award, Kora Award, and West Africa Tourism Award among others. The event was graced by personalities like former First Lady Nana Konadu Agyeman Rawlings, MUSIGA president Bice Osei Kufour and the former Tourism Minister, Nene Mike Gizo, among others. The LAL Ball, which started four years ago, is an event which seeks to celebrate the achievements and legacies of living music legends. It has already celebrated some highlife legends such as Daddy Lumba, Abrantie Amakye Dede and A.B. Crentsil.